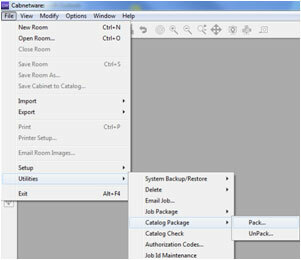 Today we will use the Catalog Package utility for saving and transporting a cabinet catalog from the manufacturing program. 2) Next, choose the drive from the available drives list. This list will show the removable drives only. And after clicking OK, the following dialog appears. This is intended to warn you that the removable drive will be cleared of all files and the Catalog will be copied to the blank device. If you don’t want to erase all files, as you might be using a USB drive that contains many files or folders, STOP here by selecting Cancel and exit the Utility. 3) To continue with the Catalog Package, hold down the Ctrl key on the keyboard as you select Catalog Package – Pack. 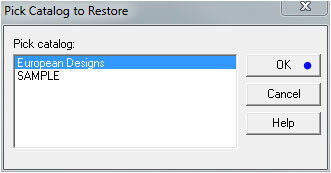 This changes modes and will allow you to select any drive and create a New Folder to select and create the package to. Create the New Folder and select it. Choose OK and Pack to begin the Packing. 4) Note there is a check box that reads Designer Catalog. This is intended to allow the Manufacturing catalog to be packed for use in the Cabnetware Design program. 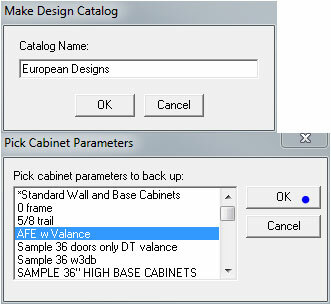 If this check box is selected, you will be prompted to supply a Catalog Name and select a Cabinet parameter file for the Design catalog to use. 5) After a period of time, the package will be created and placed on the drive or folder you have selected. 6) To Unpack the catalog, simply choose, File – Utilities – Catalog Package – Unpack, and select the Drive. 7) Select OK when prompted to insert the disk in the drive. If you created a Designer catalog package, select the name to Unpack from the list. If you had the program erase all the files on the drive when making the Package, simply choose OK and the catalog will be unpacked. If you had packed up the Manufacturer catalog to a Folder, back out of the Utility and press Ctrl and then Catalog Package – Unpack. Select the drive and folder and then Unpack. When it is complete, choose Done. This Tech Tip pertains to Cabnetware Advanced and Ultimate as well as the Design program.